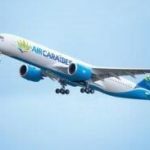 Air Caraibes promo: Non-stop from Paris to the Caribbean from €295! Air Caraibes, French carrier and regional airline of the French Caribbean (HQ in Les Abymes, Gudeloupe), is running new sale from Paris Orly this time to beautiful Caribbean isles of Martinique, Guadeloupe. Cuba or Sint Maarten. also to more exotic destination – French Guiana. Non-stop return flights incl. all taxes but excluding checked bag are now available already for €295. This is a flash sale available only till Monday so hurry up with your booking. Such a crazy low priced deals are not common. Consider service of this airline when flying to various destinations in Caribbean such as Martinique, Guadeloupe, Saint Lucia, Saint Martin, Dominican Republic, Bahamas, Cuba or Haiti also to South America (French Guiana). If interested in this latest promotion with Air Caraibes you have to look for flights in May and June 2019 .Max stay 1 month in most of the cases. Discount is available for bookings made till 15th of April or until the cheapest seats are sold out. You can easily compare all available travel options to your chosen destination directly at website of carrier. Also you can find here list of latest Air Caraibes special promo deals. Booking sample of this current Air Caraibes promo: Non-stop from Paris to the Caribbean or French Guiana from €295! As per our booking sample you would daprt from France to Saint Martin on 10th of May. Your return flight from this exotic Caribbean holiday destination to Paris Orly would be on 24th of May 2019. If you can act fast and book this deal this weekend this is awesome solution to explore many Caribbean islands with very low budget.